Our patented Hook2Hook Coil Tether is the perfect tethering solution for tools weighing up to 5 lb. (2.3 kg). With a relaxed length of 5 inches, and a stretched length of 62 inches, this tool lanyard is designed to stay out of the way when not in use. An extra-thick PU coating around the coil prevents kinking and allows the coil to retain its form. Suitable for use from holsters, belts, harnesses and tool pouches alike, the Hook2Hook Coil Tether is a versatile solution that is both resistant to heat and to sharp objects. Lightweight aluminum carabiners on either side of the extension feature locking screw-down nuts that cannot be removed. When not in use, the Hook2Hook Coil Tether stays out of the way with its relaxed length of only 5". When needed, the tether can stretch up to 62". 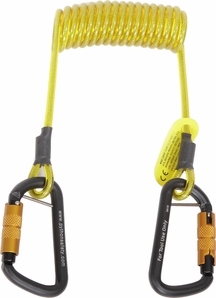 The Hook2Hook Coil Tether is made from very durable materials able to better withstand heat and sharp objects in harsh work environments. Both sides of the lanyard feature self-locking aluminum carabiners to help prevent against accidental opens.